Klotz Supertechniplate for Custom Fuel?? I have been blending my own fuel for a while now and I have been using Klotz BeNol as my exclusive lubricant. 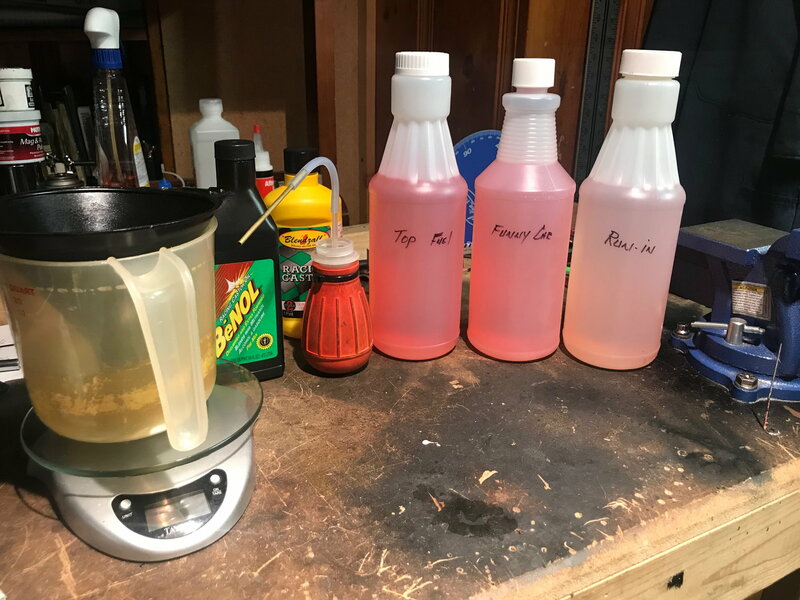 It's time for a new batch of fuel and I'm considering using the Klotz Supertechniplate (80% synthetic and 20% Benol) in conjunction with the BeNol (85% Supertechniplate/15% BeNol) this time around and probably from now on. Has any of you guys that blend your own fuel ever tried these two, and if so, how do/did you like it? That's amazing; sixty (60) views and not one response. This is the reason the Nitro fields of the hobby are dying and losing to electric fields at an accelerated rate. There's zero ingenuity from Nitro, while electric has continuous growth, progress and ingenuity. Lastly, anyone that has been in this hobby any decent amount of time and still buying someone else's fuel; shame on you. Thanks for the "viewings" and I will eventually post results of my findings. My opinion and long experience is that for onroad, you want at least 6% of the total fuel to be castor. So if you want 6% oil, use all castor (BeNol). If you want 12% oil, go half castor, half synthetic. For something in between, you can work out the numbers. I can't stress this enough, CASTOR IS YOUR FRIEND! These little screamers love it. I have had better luck with fuels that were only 7% oil but all castor than I have with fuels that were 9% but 50/50 or 10% all synthetic. Rick Vessell and Z'Stein like this. Sadly it seems like those that make own fuel are cheating... At least you know what it is and it has been made fresh, although have to be careful raw materials don't go off by absorbing moisture. I have run my own fuel 6% Benol castor/ 6% Techniplate synthetic using these Klotz oils with great success. Last edited by RB_Racer; 03-24-2019 at 11:24 PM. First off, Klotz Techniplate is 100% synthetic. Super Techniplate is 80% synthetic and 20% Benol. Benol is a polymerized castor - it’s also got some additives in it; It’s castor with a kick. It does NOT give the same lean run protection that a pure virgin castor will. The polymerizarion causes it to be a little less “safe” if you will. That said - I use virgin castor only, and Klotz Techniplate full synthetic. Depending on what part of an Engines life I’m making fuel for will depend on what the oil package contains. 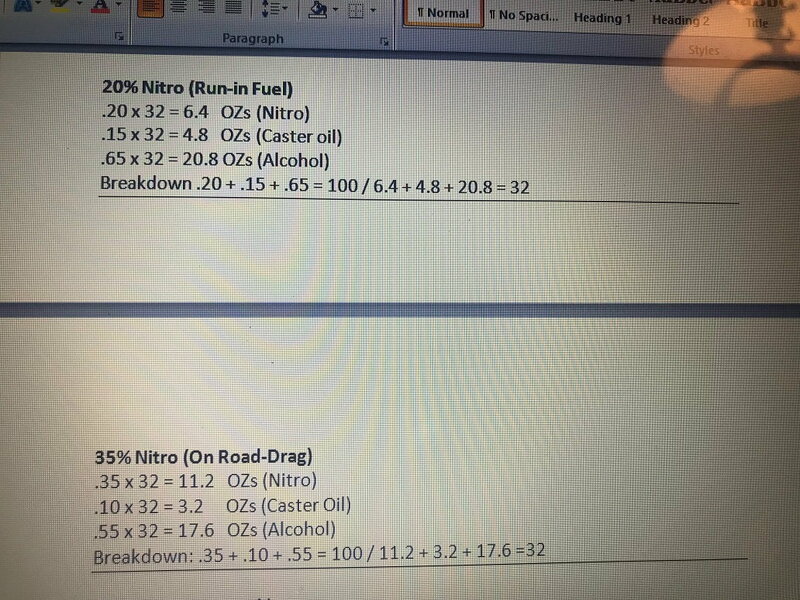 I will say my regular running fuel is 20% nitro and 11% oil. That’s 7% virgin castor and 4% synthetic - for bashing only. For racing, I’d be using 12% oil with 75% of that being castor and remainder synthetic. Why do you increase oil content for racing, most people would run less oil for racing over bashing. More oil to keep things lubricated when the engines come off the track at 300F or higher. The synthetic oil predominately used in RC fuels burn at 400-450F which is about how hot the combustion is when the tank is near empty and the engine is running over advanced (lean due to needle setting combined with low fuel level). The only thing lubricating the engine is the castor. Running a race doesn’t afford you as much throttle management as bashing IMO - meaning you’re not gonna pull off to the side to let it idle for 20 seconds to cool off a little. I don’t race and have no interest to competitively Racing. So I use 11% oil as a standard fuel for everyday use. Nothing complicated. My castor I use comes from BulkApothecary.com for about $17/gal. Klotz is cheapest from a local Kart shop. That’s where I get mine. $8-11/quart. Okay guys, I did some experimenting and discovered that Maxima MK2 will NOT work at all with methanol and nitromethane, and I'm not a big fan of the 927 either. However, the BlendZall is very good stuff and so is the Klotz (BeNol and Super Techniplate) oils. I also used Torco Nitromethane and VP M1 Methanol. I mixed up four quarts (25% with 11% oil, 35% with 10% oil, 45% with 9% oil and 55% with 8% oil), and the engines love the blends. The smell isn't bad either. 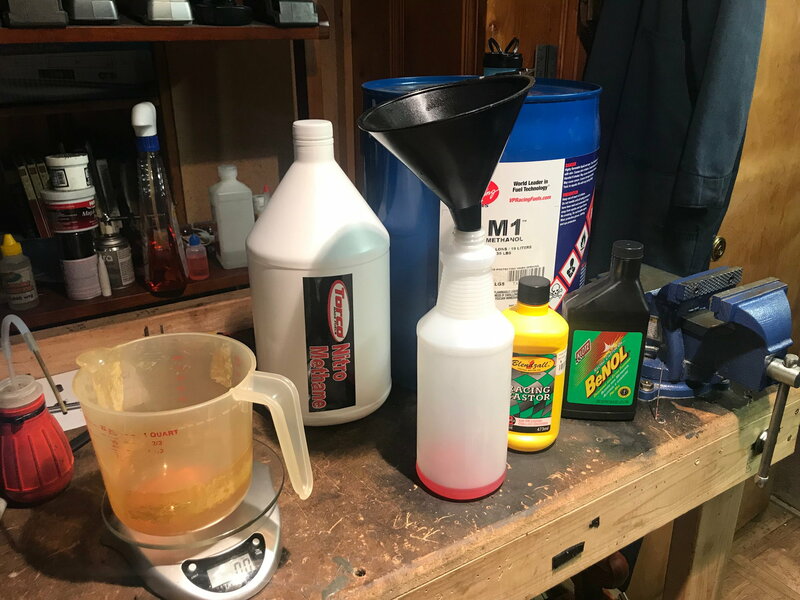 Prior to this batch of fuel(s), I was using a local Nitromethane and Morgan Castor but, I can no longer get the local Nitro and I will no longer be using the Morgan castor oil. I mostly drag race, so that explains the high Nitro percentages. 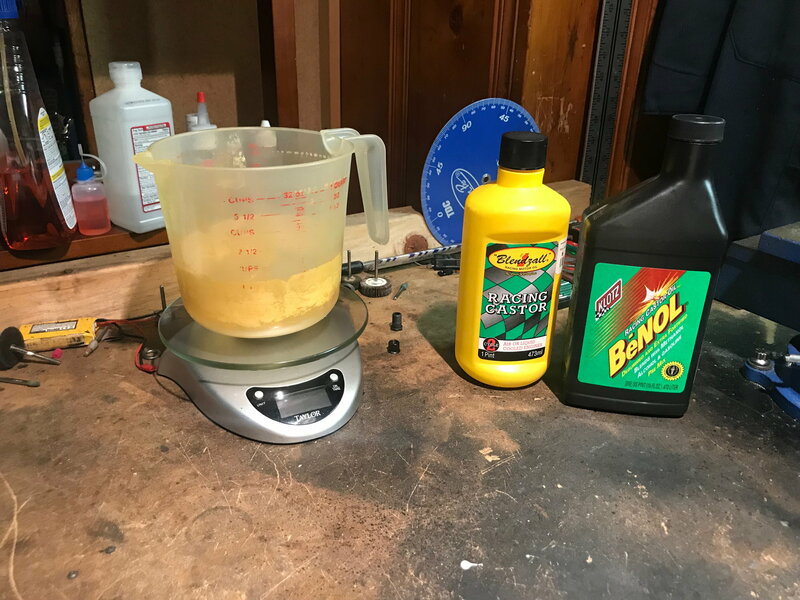 I have found that BlendZall isn't listed a lot from guys making their own fuel but it's "very good stuff" and I used a 60/40 of BeNol/BlendZall. Oh wow!! I had no ideal the pictures would be that large. Sorry guys. You do percentages based on weight? So 100 gram is 10% of 1kg? Hmmmm.... that is not how it works unless you calculate the volume back to the weight. Most reputable and upstanding fuel companies mix fuel by volume. To be more accurate, you measure by weight from a given volume. That’s how I mix it. My method may be different from your method. However, I use percentages and weight (volume). I mixed quarts (32 ounces) and to be as accurate as possible I use the weight method. As my ancestors would say; "there's more than one way to skin a cat." I have all my fuels recorded (hard copy) and all I do is follow my program. It has worked for me since the mid 80s. He's a picture of two of my fuels. In order to truly mix a fuel solely by weight, one must first determine what the mixed container will weigh. Seems to me you kinda have to start somewhere by volume, and even then, your final weight won’t be accurate because percentages based on volume versus percentages based on weight are going to be very different. So volume is easier, and what is most commonly used with no issues. 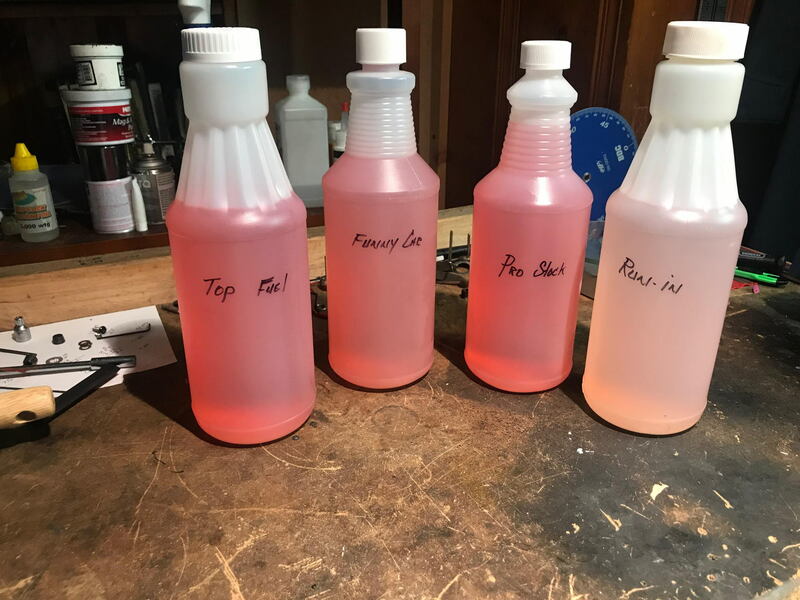 Indeed the weight is very different for the different components, especially oils, even castor oil will vary quite a bit depending on what additives they might have used. Methanol and nitro can change as well depending on supplier. That's why you need the MSDS for the product you're buying so you can use the density that they have measured accurately. The whole point in using weight as a way to measure is that you don't need to compensate for temperature. I believe there have been many posts and threads on this subject here, so some of the misconceptions found in this thread, as well as other useful information is out there.